What is Saint Patrick the patron of? Who or what is Saint Patrick the patron saint of? Saint Patrick is the patron of Ireland. Meanings, definition and origins - a patron is considered to be a defender of a specific group of people or of a nation. There is a patron for virtually every cause, profession or special interest. Prayers are considered more likely to be answered by asking a patron for intercession on their behalf. The story and history of Saint Patrick. Patrick, or Patricius, was believed to have been born in Britain c387, near the English border with Scotland. His parents, Calpurnius and Conchessa, were wealthy Roman nobles. His father Calpurnius was a Decurion, a cavalry officer in command of a troop of thirty soldiers, in the army of the Roman Empire. Calpurnius was sent to Britain to help to quell the attacks from the Picts of Scotland and the Celts of Ireland. 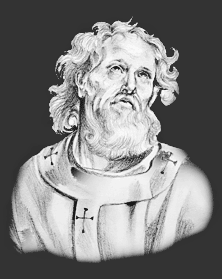 Calpurnius was a Christian, as in 380 the Roman Emperor Theodosius I (r.379 to 395) had proclaimed Christianity as the sole religion of the Roman Empire. Patrick was therefore raised in the Christian faith. At the age of fourteen Patrick was captured during a Celtic raiding party and taken to Ireland. He was a slave of the Irish and forced to herd and tend sheep. He was a slave for the next six years where he learned the language of the Irish and about their customs and religion. The Irish adhered to the religion of the Druids, whose symbol was the Serpent or Snake of Wisdom. Patrick escaped from Ireland and returned to Britain and re-joined his family. He undertook studies to become a priest, visiting several monasteries in Europe, and was ordained by St. Germanus, the Bishop of Auxerre. He was appointed as a Bishop and due to his experiences in Ireland, and his knowledge of the Irish people and the Druids , he was appointed by Pope St. Celestine I to evangelize in Ireland. Patrick knew how important the Druids were and made every effort top decrease their power and hold over the Irish people. Hundreds of soldiers supported Saint Patrick to ensure the conversion of Ireland. Churches were built in the sacred places used by the Druids. Druid teachers and wise men were killed and so were thousands of their followers. The Druids were defeated. Saint Patrick had converted Ireland to Christianity in 33 years. Saint Patrick died in 464 at Saul, a small village in County Down in Northern Ireland situated about 2 miles from Downpatrick. There are two categories of saints: martyrs and confessors. A Christian martyr is regarded as one who is put to death for his Christian faith or convictions. Confessors are people who died natural deaths. Date of Death: Saint Patrick died in A.D. 464. Place of Death: Saul, County Down, Northern Ireland. Cause of Death: Natural causes. Why is Saint Patrick the patron of Ireland? Why is Saint Patrick is the patron of Ireland? Saint Patrick is the patron of Ireland, the people of which country he converted to Christianity. His exorcism of the venomous reptiles has a similar significance as the dragon stories of the East, symbolising the conquest of good over evil, the triumph of Christianity over paganism. It is helpful to be able to recognise Saint Patrick in paintings, stained glass windows, illuminated manuscripts, architecture and other forms of Christian art. The artistic representations reflect the life or death of saints, or an aspect of life with which the person is most closely associated. Saint Patrick is represented in Christian Art he is always represented with a serpent, or snakes, at his feet alluding to the serpent symbolism of the Druids. The Feast Day of Saint Patrick is March 17th. The origin of Feast Days: most saints have specially designated feast days and are associated with a specific day of the year and these are referred to as the saint's feast day. The feast days first arose from the very early Christian custom of the annual commemoration of martyrs on the dates of their deaths at the same time celebrating their birth into heaven.